Last Thursday, Pip and I went to see Edge of Tomorrow, currently playing in theatres. 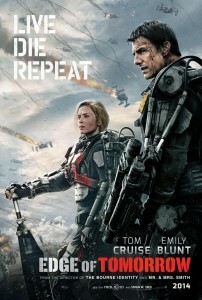 This is the latest summer blockbuster featuring Tom Cruise in what may are calling a sci-fi spin on Groundhog Day. One look at the trailer might make you think that, but there’s also some influences of Starship Troopers, Aliens, and even a nod to D-Day. Yes, the Allies’ Invasion of Normandy. In a Tom Cruise summer science fiction blockbuster.